49 Days to Go – Crunch Time! Here’s what’s happened since my last post, last year! I was really worried that my Runkeeper tracking app wouldn’t work properly overseas and at first, it didn’t. So I didn’t track all my runs whilst in Europe over Christmas. But after a couple of outings, I worked out that it does work if you manually set the country you are in. The GPS can’t seem to work that out for itself which is odd since I thought that was the point of the GPS. It’s not easy to keep to a training schedule when planes and trains are involved and you have travelled to an area of the world with only six hours decent light a day. 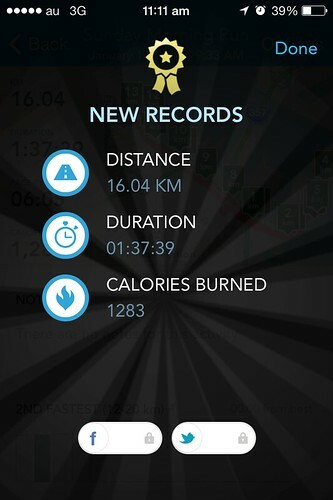 In the end though, I only missed three runs and shortened one long run down to 10 km. I got horribly lost on a long run in The Hague at night. I hadn’t sorted out the GPS problem properly at that stage either so that run turned out to take much longer than it was supposed to, mainly because I had to keep ducking into kebab shops to ask for directions. I had only run a kilometre before I began to feel a bit “uncomfortable”. Expecting this feeling to subside, I kept running. After another kilometre, I began scanning the surroundings for useful facilities. It wasn’t much longer before I started to include large trees and hedges in my search, anything really, that would afford me a bit of cover. Unfortunately, the part of The Netherlands I was in, was devoid of any of these. In the end, I was forced in desperation to cut my run short and head home. I made it with seconds to spare. This is the run I did today! I’ve never run this far before in my life. And it didn’t kill me! Well done Mel! Not long to go now….Glad the new shoes are working out for you. Shoes are perfect. I also bought two new running outfits on sale in Hannover so I’m not freezing anymore. It is quite brisk here in the evenings! That’s nearly 5 min km’s. Over that distance is pretty bloody good. Good work.